The curling season ended with the Edinburgh International Curlers’ Gathering, very much a Penicuik event. This international weekend tournament was started fifteen years ago by former member Colin McCall. Currently it is run by an Organising Committee formed from club members. The 2019 Gathering was very successful, attracting overseas teams from Canada (2), Norway, Sweden (3), Switzerland (4), and USA (4). Home based teams included Penicuik and Roaring Stones (aka Penicuik Too). Penicuik enjoyed victories in the preliminary group stage against Corriefisters and Electric Sliders (USA), and managed a peel against Apero (Switzerland), to qualify for Group B in the Final Rounds. A comfortable win on the Saturday afternoon against Team Barrdahl (Sweden) represented a good start. Penicuik then met Duddingston/Aegon on the Sunday morning, a close encounter with the teams lying peeled going into the last end, and unfortunately for us the opposition won the match with the final stone of the game. Still in contention, Penicuik finished with a re-match against Apero, who proved stronger and won the Group prize. Roaring Stones lost a fairly tight first game against O’Neil (USA), peeled against Rocks & Roses (Perth), before gaining a narrow win over Slajding Bois (Sweden), to go into Group D for the Final Rounds. A win against DAFS got them off to a good start; this was followed by a peel against Kelso Reivers. Still in contention for the Group D prize, the team met old foes (and friends) The Rock Stars (Canada), and ran out to a 5-6 defeat to miss the Group Prize by one end. The Penicuik squad included Dave Anderson, Andrew Lambie, Dave Carr, Ken Hunter, Roger Scott, Margaret Carr, Pam Ramsay, and Elaine Lambie. Players in The Roaring Stones team were Murray Hope, Jim Ramsay, Iain Scott, Ronnie Hope, and John Jacobs. Jim Cowper featured in the Corriefisters team, and Liz Anderson joined the Rocks & Roses team for the latter part of the weekend. A really big thank you to everyone on the Organising Committee, and to other club members who helped across the weekend either at the Ice Rink or by assisting in transfers between the airport and hotel. This entry was posted in Competition, External, Social on April 8, 2019 by captainken45. The Annual “Merchiston 1816” match to celebrate the first match between Merchiston and Penicuik took place on Friday 11th January. Penicuik were represented by Keith Morris, Iain Scott, Dave Carr and Reg Dunbar, and Merchiston by Chris, Morrison, Jon Addinall, John Wood and David Miller. The ice was fast and very swingy, making calling on strikes very tricky. Penicuik got the pace of the ice sooner, and built up a steady lead. Chris Morrison was repeatedly asked to play tricky saving shots which didn’t quite come off. So, Penicuik went into the last end with a comfortable 7-2 lead. Merchiston’s early stones were all taken away but they managed to score with their last 3 stones. An ambitious double take out by Keith just drew too much, allowing Chris to draw with the last stone for a three to make the final score 7-5. After the game, we went upstairs for the usual pleasant chat and refreshments. This entry was posted in Club, Social on January 15, 2019 by captainken45. Our forces were marshaled for the annual campaign against our friends from Merchiston on Sunday evening (28 Jan). the troops making up our battalion were Craig Brown, Dave Carr, Reg Dunbar, Ken Hunter, John Jacobs, Alex Moir, Jim Ramsay, and Iain Scott. After the smoke had cleared from the opening salvos (Striking), our artillerymen had failed to established their customary dominance. Worse was to come with the encounters on difficult terrain in trying to seize the initiative at Inwicking; our opponents had succeeded in establishing the forward area and a 6 point lead. Our men came back at them to recover some of the lost ground by gaining 4 points at the Draw, only to be thrust back by a counter attack at Guarding. Merchiston took the initiative at Chap & Lie, to increase their overall lead. A rally by the Penicuik men at Raising give some hope that the day could be saved, but alas it was not to be and our worthy opponents left the field of battle with a 121-114 victory. The two teams joined together for a refreshment in the bar and to view the results of past encounters. The Merchiston President Avril Anderson was presented with the trophy and her team congratulated on their fine win. Top scorers for Merchiston were John Addinall (22), David Cunningham (22), and Avril Anderson (19), the top scorers for Penicuik were Jim Ramsay (20), Ken Hunter (19), and John Jacobs (16). This entry was posted in External, Social on January 29, 2018 by captainken45. Following our final game in the International Gathering in March this year, some of us were having a chat over a beer with the guys from Curling Lausanne Olympique. Bernard, Alex, Dominic and Urs had competed in the Gathering seven times, and they suggested it was about time that the Scots reciprocated and made a visit to Switzerland. They explained that Lausanne held a competition in November each year, the “Memorial Charles Schenkel”, so after a few more beers, the Ramsays, Andersons, Carrs and Hopes were committed to the cause. We flew from Edinburgh to Geneva very early on Friday 10th November and after a short delay, whilst we waited for Mrs Carr to be released from custody by Swiss Customs, we were met by Bernard, Dominic and Urs who very kindly drove us to our hotel in Lausanne. The remainder of Friday was spent site-seeing around the city and consuming a few libations, the standard procedure for honed athletes preparing for serious competition. (Note: G+T’s approx £14 a pop!). The Lausanne Curling Hall is located in a fabulous position directly on the shore of Lake Geneva, one of the largest lakes in western Europe. The 5-sheet curling hall is on the second floor of the building and, incredibly, the walls on two sides are glazed from floor to ceiling, offering wonderful views over the harbour and the lake to the snow-capped Alps in the distance. Twenty teams entered the competition, which was divided into two sections of ten teams in each. Penicuik 1, (Andersons and Hopes), kicked off in Section 1 at 8.00 a.m. on Saturday followed by Penicuik 2, (Ramsays and Carrs), in Section 2 at 10.00 a.m. The Lausanne President, Beatrice Meier, welcomed everyone to Lausanne and gave a special, warm welcome to the Penicuik Club members for making their way to Switzerland. She explained that the originator of the Schenkel system for curling was her grandfather, Charles Schenkel, and the competition was in his memory. 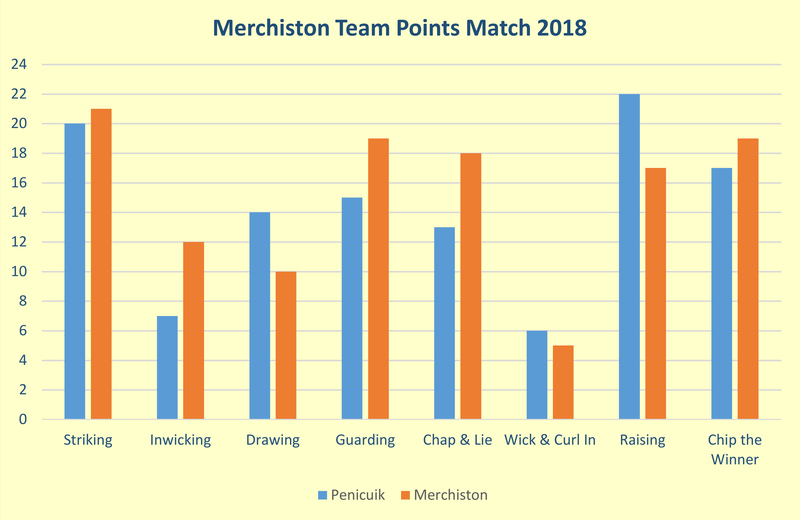 All teams played three games on Saturday and, following a Schenkel calculation of the results, two new sections were created for the Sunday session; unfortunately both Penicuik rinks ended up in Section 2. 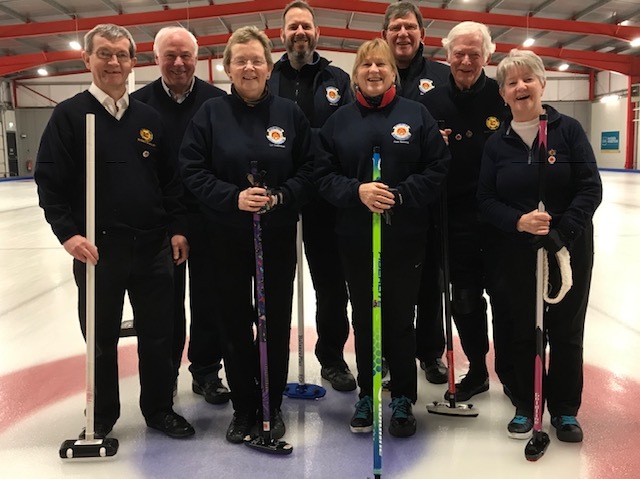 Sunday’s play involved two games and not surprisingly, having enjoyed a particularly ‘sociable’ Saturday evening, the Penicuik rinks played each other for bottom spot in the final game! No matter, our hosts were extremely good company and fun was the order of the day. Every rink we played were incredibly friendly and every rink won a prize! Our own president, Chris, thanked Beatrice and the curlers of Lausanne for their generous hospitality, and encouraged them to make the trip to Edinburgh for the International Curlers Gathering at some time in the future. Following the presentation of prizes we spent an interesting half hour being hugely entertained by the jovial Lausanne iceman, Uli Sommer. Uli knows Scotland, it’s international curlers, and it’s characters well and, as well as being a very good curler and international referee, he enjoys a dram so he fitted well in to the Penicuik company. On Sunday evening, the Penicuik party were picked up at their hotel by Bernard and his wife Elaine, Urs and his wife Sylvia, Alex, and Dominic, and transported to the Restaurant Le Chalet Suisse, where we had lots of fondue, cherries in kirsch, ice cream, and Swiss wine; a wonderful way to finish a great weekend with very good friends. Over the years, rinks from Penicuik Curling Club have flown the flag in Latvia, Denmark, Sweden, and Switzerland (outdoors). We can now add Switzerland (indoors) to that list. Each time, new friendships are born and old friendships renewed. Each time, the brother and sisterhood of curling never ceases to amaze those involved. This time was no exception and we thank the members of Curling Lausanne Olympique for making us so welcome. This entry was posted in Club, Social on December 4, 2017 by captainken45.